Men's Early Bird pricing ends on April 27, after which the late pricing will apply. Bikes Men: - Elite and B/C races are for CX bikes ONLY (note: max 33mm tyres & drop handle bars), Open is for any bike (inc MTB, gravel, monster cross etc bikes). The WACX Philosophy: SuperCross18 is all about inclusion, challenging yourself, having fun and racing bikes under lights!! Course Set up and build: 'build it and they will come' head Friday 3th May and help build the course you race. If you can't bang in the poles help with rego, timing, ongoing course maintenance, marshals, anything - before or after your race. Just ask or use your initiative. No need to be precious - because cyclocross. Start procedures: - The Chief Commissaire will do a call up, separate grades and send them away in waves (eg separated by say 1 minute) if grade numbers are sufficient. Small grades may be combined. All results are captured separately regardless of startline grouping. CX bikes must run CX tyres - 33mm max width (as written on tyre with tiny allowance for tyre flare on wide rims). Definitely no gravel grinder or Monster Cross tyres in CX Race Category. Male riders can race in Open Category with any width tyre, any style of bike. Series Races - minimum ages - Older juniors (say U15), with suitable experience, looking to race the full course for a full race duration can enter C Grade in WACX. "What grade should I ride in CX?" A lot of people struggle with finding the right grade in CX, generally for one of two reasons; 1) They race, but are new to 'cross, or 2) They have never raced. "be guided by your motor"
What does that mean? It means that you should ride against riders of similar strength, not drop down because of some perceived disadvantage around tech skills. Some examples: If you race A grade on the Road/MTB or at your local crit, we request that you enter Elite grade for CX. If you don't race but you are a similar level to some of your training buddies who race B grade on the Road/MTB, enter B grade. If you have never raced and aren't able to gauge a grade off any of your training partners, you should enter C Grade and see how you go. You will be asked for Grading Information at entry. Please provide information that helps the Handicappers either confirm your requested grade or determine the correct grade for you. Information helps get you into the correct grade. Also note that you request a grade, and that may be changed by the Handicappers. The published Final Start List is confirmation of your grade for race day. WACX can and will encourage riders that are capable of riding the next grade. If you are in a lower grade and are consistently lapping times that are above the mean time in the grade above you will be promoted. SuperCross does not enforced the 80% rule, lapped rider just leave the racing line open for the quicker riders to ride past. WACX is currently self timed and requires volunteers for this to happen - please help us to time you. Before the start of any CX race we need at least three people to enure the results are accurate. Preferably Men's C wave should be administered by riders from Women's wave and reciprocated. Men's B wave should be administered by riders from Men's Elite wave and reciprocated. I understand that many riders like to see their times, if you do please help out. Don't complain if you don't volunteer in the timing tent, as it doesn't fit the WACX ethos. To put it nicely, the whole racing bike license thing is a Dog's Breakfast. Close your eyes and imagine a world every time you jumped into a different car you had to pay for a different driving license, even though they have four wheel and an engine, the only difference is they are suited for specific surfaces. 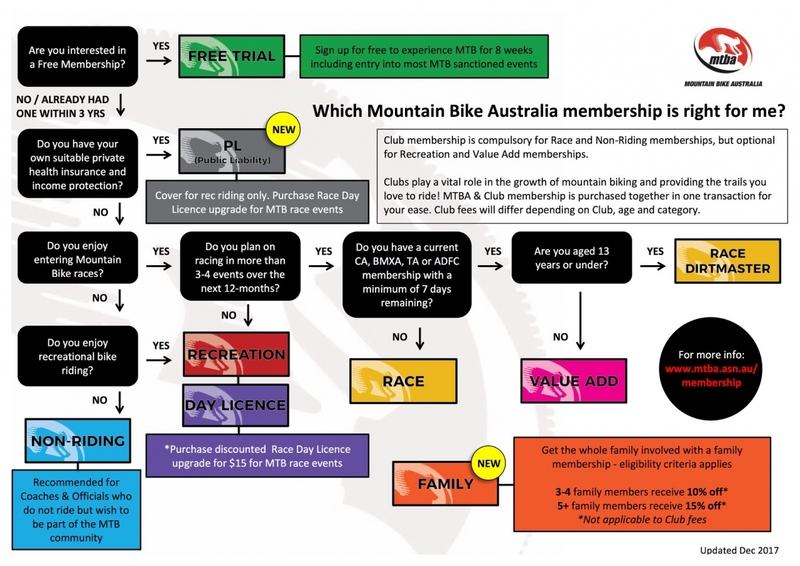 Adult riders can race on either a CA & MTBA race license or purchase a Day Race License (please purchase here https://www.mtba.asn.au/product/senior-race-day-licence-19-years-and-over/) which is very basic at best. It really is easier to get an annual license. PLEASE BRING YOUR LICENSE RACE DAY as it will need to be sighted at Rego. If you are still waiting on your license, or you are racing on an MTBA trial license, please bring a print-out of your confirmation. If possible, avoid looking things up on phones - OK if you forget - but not always 100% reliable in our experience. It is your responsibility to ensure you (or children under your care) to have the correct license that covers you (or children under your care) to race in a cyclocross race hosted by WACX. *prices may vary depending on state and club. Please register your child(ren) collect plate ($10 one off plate fee, $15 participation license - if required), write their name on the front, zip tie it on and be at the start line for 1200 start, ready to cheer them on. You will be advised of your entry status by email after entering. It is possible that you will be waitlisted for your chosen grade if the rider count exceeds our pre-set limits (noting these are quite high for cross and generally not an issue). If you are waitlisted, you are basically waiting for a spot to come available through Scratchings or riders being re-graded. Many waitlisted riders end up riding so don't give up all hope of getting a ride. If you'd rather not wait and want to be removed for the waitlist, please Scratch yourself from the race. Cyclocross is a very specific type of bike racing. For the most part, the course is off-road but there are sometimes portions of pavement included in the course. You can expect to encounter grass, dirt, mud, gravel, sand, and a whole slew of other assortments and combinations. The races are based on a set time (measured by numbers of laps), not distance. Depending on your category, a race can be as quick as 30 minutes (for beginners), or as long as 60 minutes (for elite men). WACX has created and Open Category in Mens for any bike, this will help with correct grading. Women's C is still open to any kind of bike you like, so grab your mountain bike and come on down. In most cases, race officials wait to see how quickly riders complete the first lap before deciding how many total laps will be completed. Depending on course conditions and pack motivation, the total time may be a few minutes less or more than the race flyer lists. Cyclocross is a winter sport, with the first race around the end of May, and the last in September. This means that if you look outside and see rain, hail, or shine (we have had all of these on the same day), the show will still go on, and often, the more inhospitable the weather, the more fun the racing.